great article john. thanks for turning me onto hypermiling. Yeah! Let's all coast behind other vehicles to save gas. Weee look at me I just rear ended a family of four but I improved my gas mileage by a whooping 2mpg. The whole driving without brakes thing is brilliant too! I mean who needs to stop anyways. It’s good to try ways to improve efficiency but maybe we should focus on things like car pooling or perhaps taking a bus. Why not avoid getting in your car in the first place to drive halve a block to the nearest Starbucks when you could just stay home and brew your own coffee instead. I really don’t need a gauge to tell me just how much I am wasting energy, I already know that, I'm an American darn it! "such as coasting in the draft of semis"
if by that you me tailgating a semi then i say you better have good insurance. im a truck driver and i drive thousands of miles a month and see alot of accidents. By "coasting" you wont be able to see the traffic ahead of you and youll be in the truck drivers blind spot. very very imature. try driving with you're shoe off you'll get a better feeling of the gas peddal. You want to improve gas mileage and cut CO2 emissions and help improve the environment ? Don't sit in the drive up at McD's. Do something radical....park turn off the engine and walk inside to place your order. Geez...that would be getting exercise...something alot of Americans need these days. My new Avalanche also has a real-time fuel efficiency readout. It's cool to see 2 mpg upon acceleration and a up to a whopping 99 when coasting. It's really not too bad, I have averaged about 14 mpg so far. What we realy need is the alternive power, Hydrogen, Electric and even compress air engines. 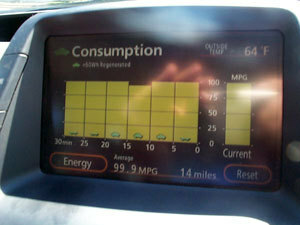 Stop with the "Fuel Efficiency" and break-a-way from the old fashion fossil fuels. My '97 Chevy Blazer has a fuel usage guage! It also gets better mileage tyhan this P. O. S.
The funny thing is he drives 2 hours per day to work and then claims to be saving money? How about getting a job a little closer or ride sharing with someone, or maybe moving closer to work. If you want to save gas its easy... DRIVE LESS! While I agree w/ others about drafting in real world driving (race track only, please), the idea of brakeless driving in this instance means being aware of what's going on ahead of you to the point that you can lift off the gas and glide down to the slowup/stop ahead of you using little or no brake pedal. Most drivers in todays world go directly from the gas pedal to the brake, wasting the energy used to get up to speed in the first place, and putting unnecessary wear on the brakes. In the absence of regenerative braking in hybrids, this gas-to-brakes technique is wasteful. This will also teach the average driver, who is blissfully unaware of what is going on ahead of him or her, the opportunity to be prepared for unexpected deceleration by the driver(s) ahead. It's always a delight to read the sarcastic diatribe of some smugly self-righteous know-it-all who can denigrate the content of an article and simultaneously lecture the rest of the Great Unwashed about their egregious laziness...particularly when the author didn't make the minimal effort necessary to properly use the language (or at the very least, a SPELLING CHECK). Obsessive Compulsive Disorder - A psychiatric disorder most commonly characterized by a subject's obsessive, distressing, intrusive thoughts and related compulsions which attempt to neutralize the obsessions. I think it's great to make every effort possible to save gas, within reason. I've tried some of the techniques (though not to that extreme) mentioned in the article. You can tell you've gone overboard when you are causing potentially dangerous situations on the road. No one's life is worth trying to save a few gallons of gas. Also, by driving that way, you cause others to unduly brake or accelerate because they don't anticipate your actions, thereby causing them to waste the fuel you've saved. By all means save gas (i.e. funding Al Qaeda), but don't negate your conservation by causing others to waste more. Please Join Me in Actually Saving the Enviroment by turning around Pollution Now <>< We are starting testing soon on Airplane Engines & Diesel , and the PICC is already proven on 2 cyl, 2 Stroke Motors ! And has no exaust pollution at all ! Don't worry about gas mileage and long term energy supplies! According to several theorists and both the Hopi and Aztec calendars, the world is due for a major cataclysm by the end of 2012. So enjoy your UBER-sized Suburban, HumVee, and other SUVs while you can. When I used to have a long commute and gas had just jumped in price, I did drive in trucker's draft, but they hated it. Better solution that nobody seems to be talking about... you are running the generator constantly, no matter what... use it to perform electrolysis, then feed the hydrogen/oxygen mix with the fuel. Mileage goes up by double digit numbers. Kits are available on-line. Google "water driven cars" if you want to see the future. I was doing a number of hypermiling techniques taking a co-worker to lunch, including coasting in neutral with the engine off. It was not noticed until the third lunch, so why are these hypertrollers making Wayne Gerdes sound like he is a Blue Angel's flunky? Have you seen the 247 advanced gas saving tips at www.savegasnow.org? Yes, drafting does help. And it's not dangerous if you are aware of what's going on farther ahead. Also, most people think that 'to draft' that you have to be bumper-to-bumper... You don't! A driver can maintain a safe gap and still benefit by saving gas. I recently bought a four door 1995 Chevrolet Blazer which I am pretty happy with so far. On the side there is a tag that says LT. I have seen other Blazers like mine with an LS or nothing at all on the side. What do these things stand for and how many different Blazer sub-styles are there?